The course is designed to provide you with an overview of all taping methods in performance and clinical practice. At the end of the course you will be able to confidently apply theory to practice in sports taping principles and application. You will have a greater skill base & knowledge on tape applications to put into clinical practice immediately. Ian is a highly experienced chartered physiotherapist with a private practice in Cavan. He has been working with professional athletes and inter-county football teams for the last 15 years. Over the past 3 years Ian has taught on Taping courses throughout Ireland, the UK , Europe and North America. Certificate of attendance will be provided on completion. All Tapes will be provided for use during the course. Places are limited in order for participants to get the maximum exposure to the taping applications. Places will be guaranteed on receipt of payment on a first come basis. The course is practical-participants will practice taping techniques on eachother. Please wear suitable clothing. Additional Taping Starter Kits will be available to purchase at the end of the course. Dynamic Taping is a novel approach developed by a Musculoskeletal Physio, that uses a specially designed, highly elastic tape to contribute energy into the kinetic chain. It is not designed to limit range like rigid tapes but rather to permit full range whilst still providing strong support where needed. 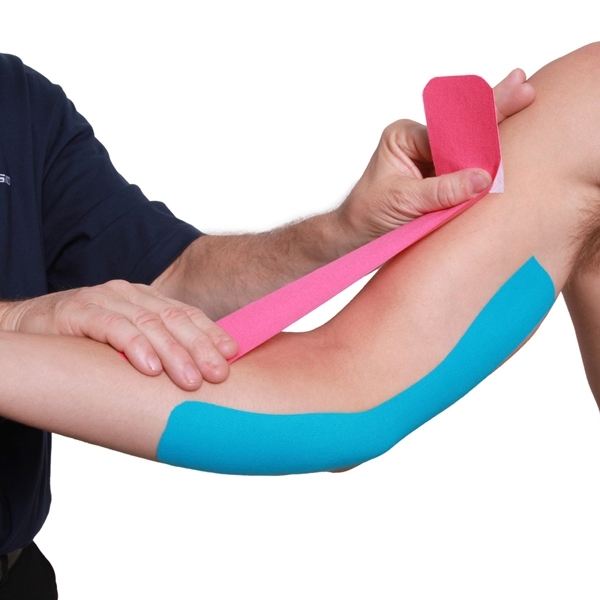 The unique properties and four way stretch permits taping ways not previously possible with rigid tapes, non wovens or Kinesio Tapes. Highly practical 4 hour workshops which provide participants with a clear understanding of the major principles & equips them with a number of techniques that can be used immediately in clinical practice. It builds on the Physios own knowledge of biomechanics & encourages them to develop their own techniques in order to meet the individual needs of their clients. On completion of the workshop we offer ‘Tape Starter Packs’ at a Special Discount rate. On completion you will receive a certificate of completion. The workshop entitles you to claim for 4 CPD hours. For the Dynamic or Kinesio Taping courses if you organise a group of your colleagues and a training location we can run a course specifically for this group. We ideally require a minimum of 10 people and the maximum number is 26. To ensure that minimum numbers are received we can market the course through our website. In return for use of the room, you receive one free place for every ten attendees on the course. Please call us for further details on this.